Color Most commonly black, but can range from brown, violet, green, pink, or in a dual-colored pink and green. Crystal habit Parallel and elongated. Acicular prisms, sometimes radiating. Massive. Scattered grains (in granite). The tourmaline mineral group is chemically one of the most complicated groups of silicate minerals. It is a complex silicate of aluminum and boron, but because of isomorphous replacement (solid solution), its composition varies widely with sodium, calcium, iron, magnesium, lithium and other elements entering into the structure. The stones are mainly valued as gems. 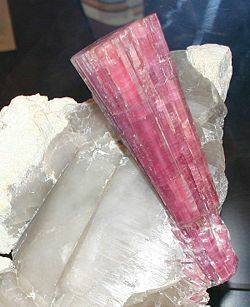 Tourmaline belongs to the trigonal crystal system and occurs as long, slender to thick prismatic and columnar crystals that are usually triangular in cross-section. Interestingly, the style of termination at the ends of crystals is asymmetrical, called hemimorphism. Small slender prismatic crystals are common in a fine-grained granite called aplite, often forming radial daisy-like patterns. Tourmaline is distinguished by its three-sided prisms—no other common mineral has three sides. Prisms faces often have heavy vertical striations that produce a rounded triangular effect. Tourmaline is rarely perfectly euhedral. 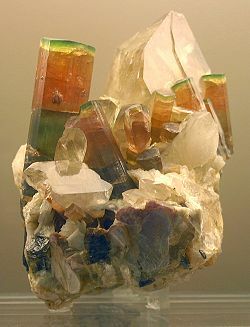 An exception was the fine dravite tourmalines of Yinnietharra, in western Australia. The deposit was discovered in the 1970s, but is now exhausted. All hemimorphic crystals are piezoelectric, and are often pyroelectric as well. Tourmaline crystals when warmed become positively charged at one end and negatively charged at the other. Due to this effect, tourmaline crystals in collections may attract unsightly coatings of dust when displayed under hot spotlights. Tourmaline's unusual electrical properties made it famous in the early eighteenth century. Brightly coloured Sri Lankan gem tourmalines were brought to Europe in great quantities by the Dutch East India Company to satisfy demand as curios and gems. At the time it was not realised that schorl and tourmaline were the same mineral. Tourmaline has a wide variety of colors. Usually, iron-rich tourmalines are black to bluish-black to deep brown, while magnesium-rich varieties are brown to yellow, and lithium-rich tourmalines are practically any color—blue, green, red, yellow, pink etc. Rarely, it is colourless. Bi-colored and multicoloured crystals are relatively common, reflecting variations of fluid chemistry during crystallisation. Crystals may be green at one end and pink at the other, or green on the outside and pink inside—this type is called watermelon tourmaline. Some forms of tourmaline are dichroic, in that they appear to change color when viewed from different directions. The most common variety of tourmaline is schorl. It may account for 95 percent or more of all tourmaline in nature. The early history of the mineral shows that the name "Schorl" was in use prior to the year 1400 C.E., because a village known today as Zschorlau (in Saxony, Germany) was then named "Schorl" (or minor variants of this name). This village had a nearby tin mine where, in addition to cassiterite, a lot of black tourmaline was found. The first relatively detailed description of schorl with the name "schürl" and its occurrence (various tin mines in the Saxony Ore Mountains) was written by Johannes Mathesius (1504 — 1565) in 1562 under the title "Sarepta oder Bergpostill" (Ertl, 2006). Up to about 1600, additional names used in the German language were "Schurel," "Schörle," and "Schurl." From the eighteenth century on, the name "Schörl" was mainly used in the German-speaking area. In English, the names "shorl" and "shirl" were used in the eighteenth century for schorl. In the nineteenth century the names "common schorl," "schörl," "schorl" and "iron tourmaline" were used in the Anglo-Saxon area (Ertl, 2006). The word tourmaline is a corruption of the Sinhalese word turamali, meaning "stone attracting ash" (a reference to its pyroelectric properties). The meaning of the word "schorl" is a mystery, but it may be a Scandinavian word. Tourmaline is found in two main geological occurrences. Igneous rocks, in particular granite and granite pegmatite, and in metamorphic rocks such as schist and marble. 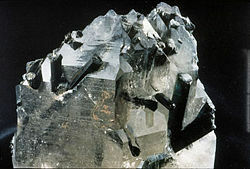 Schorl and lithium-rich tourmalines are usually found in granite and granite pegmatite. Magnesium-rich tourmalines, dravites, are generally restricted to schists and marble. Also, tourmaline is a durable mineral and can be found in minor amounts as grains in sandstone and conglomerate. 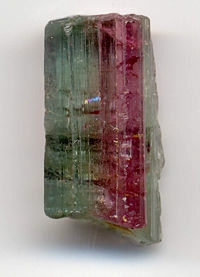 A bi-colored tourmaline crystal, 0.8 inches (2 cm) long. Today, gem and specimen tourmaline is mined chiefly in Brazil and Africa. Some placer material suitable for gem use comes from Sri Lanka. Some fine gem and specimen material has been produced in the United States, with the first discoveries having been made in 1822, in the state of Maine. California became a large producer of tourmaline in the early 1900s. The Maine deposits tend to produce crystals in raspberry pink-red as well as minty greens. The California deposits are known for bright pinks, as well as interesting bicolors. During the early 1900s, Maine and California were the world's largest producers of gem tourmalines. The Empress Dowager Tz'u Hsi, the last Empress of China, loved pink tourmaline and bought large quantities for gemstones and carvings from the then-new Himalaya Mine in San Diego County, California. Almost every color of tourmaline can be found in Brazil, especially in the states of Minas Gerais and Bahia. In 1989, miners discovered a unique and brightly colored variety of tourmaline. The new type of tourmaline was found in the state of Paraíba, which soon became known as paraiba tourmaline, came in unusually vivid blues and greens. These colors were often described as "neon" because they appeared to glow. Brazilian paraiba tourmaline is usually heavily included. Much of the paraiba tourmaline from Brazil actually comes from the neighboring state of Rio Grande do Norte. Material from Rio Grande do Norte is often somewhat less intense in color, but many fine gems are found there. It was determined that the element copper was important in the coloration of the stone. The demand and excitement for this new material, which has fetched more than $50,000 per carat, earned more respect for the other colors of tourmaline. In the late 1990s, copper-containing tourmaline was found in Nigeria. The material was generally paler and less saturated than the Brazilian materials, although the material generally was much less included. A more recent African discovery from Mozambique has also produced beautiful tourmaline colored by copper, similar to the Brazilian paraiba. While its colors are somewhat less bright than top Brazilian material, Mozambique paraiba is often less included and has been found in larger sizes. The Mozambique paraiba material usually is more intensely colored than the Nigerian. There is a significant overlap in color and clarity with Mozambique paraiba and Brazilian paraiba, especially with the materia from Rio Grande do Norte. While less expensive than top quality Brazilian paraiba, some Mozambique material sells for well over $5,000 per carat, which is still extremely high compared to other tourmalines. Another unique variety that is also highly valued is chrome tourmaline, a rare dravite tourmaline from Tanzania, which occurs in a rich green color caused by chromium (the same element that produces the green in emerald). Of the standard Elbaite colors, generally blue indicolite gems are the most expensive, followed by green verdelite and pink to red rubellite. Ironically the rarest variety, colourless achroite, is not appreciated and is the least expensive of the transparent tourmalines. In addition to Brazil, significant amounts of tourmaline are also mined in Tanzania, Nigeria, Kenya, Madagascar, Mozambique, Namibia, Afghanistan, Pakistan, and Sri Lanka. Some Tourmaline gems, especially pink to red colored stones, are altered by irradiation to improve their color. Large Pink Elbaite Crystal on Quartz, Cryo-Genie Mine, San Diego County, California. ↑ Tourmaline group. Mindat.org. Retrieved March 24, 2007. This Web site details how the complex chemical formula is structured. ↑ Klein, Cornelis, Cornelius Searle Hurlbut, and James Dwight Dana. Manual of mineralogy: (after James D. Dana). New York: Wiley, 1985. ↑ Nassau, Kurt. Gemstone Enhancement: Heat, Irradiation, Impregnation, Dyeing, and Other Treatments Which Alter the Appearance of Gemstones, and the Detection of Such Treatments. London: Butterworths, 1984. Ertl, A., F. Pertlik, and H.J. Bernhardt. Österreichische Akademie der Wissenschaften, Mathematisch-Naturwissenschaftliche Klasse. Abt. I, Anzeiger 134:3-10, 1997. Ertl, Andreas. Mitteilungen der Österreichischen Mineralogischen Gesellschaft 152:7–16, 2006. Webpage Source Retrieved August 5, 2007. Tourmaline International Colored Gemstone Association. Tourmaline Classification Scheme Department of Geology and Geophysics, Louisiana State University. This page was last modified on 11 December 2015, at 23:37.